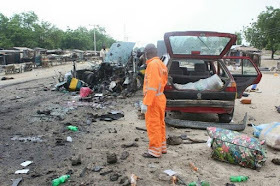 Home / featured post / Update On Maiduguri Bomb Blast This Morning + Photos From The Blast Scene. 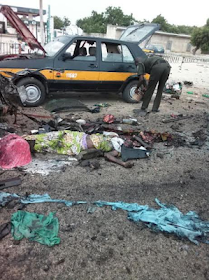 Update On Maiduguri Bomb Blast This Morning + Photos From The Blast Scene. 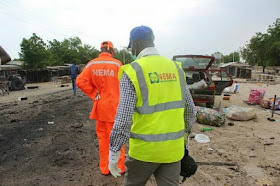 Here are photos of emergency response team at a scene of bomb blast which occurred in the early hours of today at Muna Garage Along Maiduguri, Ngamboru Ngala Road, Borno state. 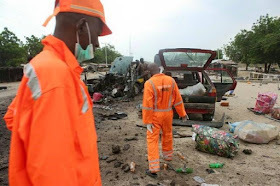 Eight people are reportedly dead while fifteen people injured have been taken to Hospitals within Maiduguri metropolis, according to the National Emergency Management Agency NEMA. 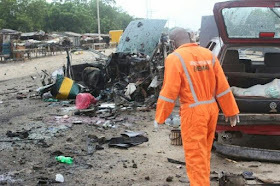 Security Agencies are expected to give full details of the incident after initial investigations have been concluded.